Fall officially began a couple of days ago, and while the thermometer doesn't exactly reflect the change of seasons, your fashion sense does. You may go back to peep toes next week, but at the moment you're all about autumn. 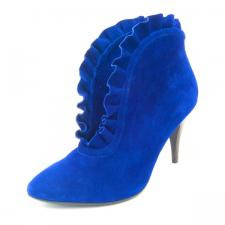 Honey, you'll be hot (as in gasping for air and sweating) in tall boots, but haute (as in inspirational) in a pair of open-faced booties, like the these blue Piper ankle skimmers from Lovely People. You're not really into the high-heel hype, so their three inch heel height is definitely your forte. The ruffles are so "this season," as is the color. Plus, the open face means you can do the sans-socks/ stockings look now and then opt for opaque tights once the temperature starts to drop. (We suggest black, gray or an eye popping hue like neon green.) Oh, and lower heels tend to mean the possibility for higher cocktail intake (slimmer chances of taking an ugly tumble). These shoes have an 80's pop appeal that may transport some of us back to the cartoon-laden days of our childhoods. Smurfs anyone? (Seriously... they definitely have a little Smurfette flair.) 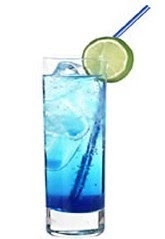 That said, order a Smurf (recipe and image courtesy of BlueBuddies.com) at happy hour tonight. It's a fruity-flavored concoction that combines Strawberry Vodka (Stolichnaya Strasberi should do the trick), Blue Curacao, a little lime juice and a bit of lemon/lime soda. If you're one who's into strong drinks, have the bartender use less soda and more vodka. However... be sure to check for blue teeth and tongue frequently. The cute guy who just walked in may dig blue shoes, but a blue you might be a bit much. These have my name written all ova!